I remember watching the news accounts of the city-wide manhunt for Brian Nichols after he opened fire throughout an Atlanta courthouse and staged an escape. I remember watching news accounts of the lives lost during that day. I remember hoping beyond hope that law enforcement agencies would apprehend him without any further loss of life. Amazingly, Nichols surrendered to officers. While I heard a bit about the story of his hostage, Ashley Smith, and her role in his surrender--I was very interested in reading her story in her own words. Smith's book, originally titled, Unlikely Angel, has been re-released along with the upcoming motion picture release of her story: CAPTIVE. We had the opportunity to review Smith's book, CAPTIVE, and we also have a copy available for one reader to win at the end of this post! 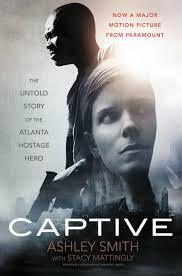 What did I think of CAPTIVE? Quick Summary of CAPTIVE. CAPTIVE, based on a miraculous true story that drew the attention of the entire nation, is a thrilling drama about the spiritual collision of two broken lives. When Brian Nichols - on the run as the subject of a city wide manhunt and desperate to make contact with his newborn son - takes recovering meth addict Ashley Smith hostage in her own apartment, she turns for guidance to Rick Warren’s best-selling inspirational book, The Purpose Driven Life . While reading aloud, Ashley and her would-be killer each face crossroads where despair and death intersect hope. CAPTIVE tells Ashley Smith's life changing story. 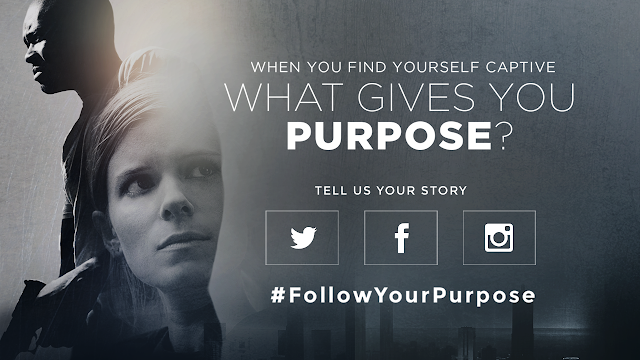 This story looks inside the events of the night, 10 years ago, when Ashley Smith found her purpose. There is no question that this young, widowed mother was struggling with many aspects of her life when her paths crossed with Nichols. It isn't easy to like the person Ashley Smith was--or to relate to her descriptions of her interactions with the, now convicted, killer. Ashley Smith tells her story. She tells her feelings, thoughts, emotions, and perceptions. While it wasn't easy to relate or to sympathize with her (or with Nichols) at times--it became easy to respect her for embracing the changes that that day brought to her life. CAPTIVE is more than a true crime story. While the author tells the story as a play by play record of her ordeal--she shares her true emotions and thoughts. She gives the readers glimpses of the troubled and painful past--and bits of hope that helped form her perceptions--and ultimately led to the situation's resolution. With the original title, Unlikely Angel, the author addresses her own shortcomings--and discovers that even her misguided life had a greater purpose. Would I recommend CAPTIVE? There are only two people who know the events surrounding that Atlanta night: Ashley Smith and Brian Nichols. Ashley Smith lets readers inside as she shares her views of the events. This is a personal story that moves through the time line of the hostage situation--but, also meanders through the author's past as the events unfold. This is a book of redemption. Not necessarily for Nichols--but, for Smith. I left the book with the sincere hope that Smith's experiences will lead to lasting changes for her and her family. My child is my purpose.